March is the month which marks the end of winter and the beginning of summer. The temperature begins to soar and goes up to exceptionally high levels in some parts of India. The scorching heat makes everyone run for cover. However, India has some of the best places which can help one to beat the heat. These places are spread across the country: from the lofty mountain peaks in the north to the beaches and small hill stations in the south. 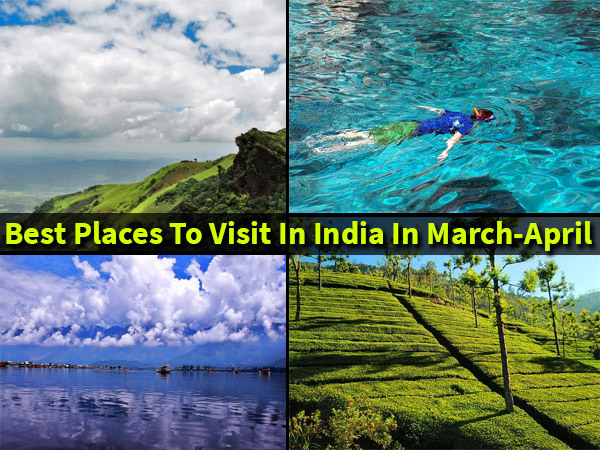 March is seen as an ideal month for a nice holiday throughout India. With the beginning of this month, winter bids goodbye to most parts of the country, which adds on to the beauty of many scenic places. The month offers a pleasant and tranquil environment for enthusiastic travellers and is also a time for many festivals and fairs in the country. March is also the month which marks different kinds of tourist activities, and is especially ideal for bird watching and enjoying mother nature's gift of beautiful views. We bring to you a short list of 15 beautiful places which can be visited during this month. So be prepared to pack your bags and set off on a journey. It is one of the most serene and beautiful destinations in the state of Karnataka. It is mostly popular for its coffee plantations and a pleasant climate which remains throughout the year. Situated at a height of 3400 ft, this hill station will never disappoint you. Although it remained unexplored for a very long time, all thanks to its picturesque landscapes and greenery, it has earned a lot of attention from tourists across the country. Alappuzha or Alleppey is Kerala's backwater hub, with a vast network of waterways and more than a thousand houseboats. Wandering through this small yet chaotic city centre is a grid of canals, which gives it the very apt title 'Venice of the East'. In the month of March, one can witness a lot of temple festivals, with elephants and drum beats. A visit to these temple festivals will surely get you jumping with energy. The place becomes more graceful and green as you go through the watery world of villages, where one can see every household with at least a minimum of one small boat instead of cars and bikes. Amritsar means the holy pool of nectar. It is the spiritual and cultural centre of the Sikh religion. The Baisakhi festival brings out the splendid face of Amritsar with its finest food, clothes and merry making. It is also known for the Jallianwala Bagh massacre and its close proximity to the Wagah Border. It is one of the holiest cities with the Guru vaani humming from the Gurudwaras. It is renowned across the globe for the Golden Temple, also known as Harimandir Sahib. It was the home of one of the fascinating dynasties, the Mughals. The Taj Mahal here is worth a visit. One would have heard many cliches around it, but no matter what, it would still take your breath away. This white tomb built by Shah Jahan in the memory of his beloved Mumtaz Begum, is also known as Mumtaz Mahal. Early March is the best time to visit the Taj Mahal. Stand along with the crowd and immerse yourself in the beauty of one of the seven wonders of the world. If you want to get lost in the world of the colonial charm, then Ooty is the destination for you. Take a ride on the toy train. The sleepy hamlet has a sense of timelessness, and is host to the lush botanical gardens, lakes, tea plantations and waterfalls. Do not forget to visit the Ooty Lake and the Doddabetta Peak. This place is not only known for the famous Jim Corbett National Park, but also the natural beauty with its tea gardens and rich biodiversity. It is highly distinguished for its intensively dense forested land, green vegetation and unique wildlife. Located in the Bay Of Bengal, Andaman and Nicobar Islands is an extensive group of islands which consists of about 600 islands, out of which only 36 are inhabited. The group is divided into Andaman and Nicobar: 9 islands in Andaman are open to tourists. The islands are known for their pristine beaches, corals, marine life and water sports along with the remains of the Stone Age culture. The islands are covered with lush forests and varieties of exotic flora and fauna. The verdant foothills of the Himalayas welcoming the river Ganga as she continues her journey towards the Bay of Bengal, Rishikesh has been the abode of sages since time immemorial. It is also the gateway to the Char Dham and is considered as the Yoga capital of the world. Rishikesh offers white water rafting for the adventure-seeking junkies and attracts travellers every year who seek adventure, excitement and thrill which is offered here in its best form. Kashmir, with its beautiful gardens, friendly people and glaciated streams, is one of the most serene places on earth which attracts tourists from across the globe. It has gained immense popularity due to its cold weather and picturesque view. Foodies can enjoy the local cuisine amidst snow-clad mountains. Rogan Josh, Yakhni, Dum Olav and Aab Gosht are some of the most popular and appetising dishes of Kashmir. Goa is known for its numerous festivals which happen in the month of March. One of these is the 'Shigmotsav' which happens to be Goa's version of Holi. 'Sabado Gordo' in Panaji is held on the Saturday before Lent and is celebrated by a procession of floats and loud street parties. The Procession of the Saints is the only procession of its sort outside Rome. Thirty statues of saints are brought out from storage and taken out as a parade around Old Goa and its neighbouring villages. It is the perfect time for parasailing, wind surfing and water skiing which makes the beaches of Goa a fun-filled place. Filled with lush green grass plots, dense hills and breathtaking scenic beauty, Yercaud is located in Salem district, with a part of the Shevaroys range of hills in the Eastern Ghats. It has several hills and bountiful areas to explore. Most of the best places to visit in Yercaud are filled with natural beauty and abundance of flora and fauna which makes this laid-back hill station a mesmerising and enthralling holiday destination. Gifted with beautiful lakes, temples and exotic scenery, Nainital is a hill station surrounded by the peaks of Kumaon Hills and filled with natural hot springs. This beautiful town is divided into two parts, Tallital and Mallital, which are separated by the lake. Tallital is on the southern side, while Mallital holds the northern upper reaches. It is also known as the lake district of Uttarakhand and is named after Goddess Naina Devi. The town offers a multitude of options for tourists who come looking for adventurous activities like trekking, paragliding, skiing etc. Besides the adventurous activities, Manali has a lot of temples which attract the tourists and devotees alike. The Hadimba temple which was built in the 14th century is famous for its wooden architecture and for its religious values. Manali also serves as the base camp for the Manali-Leh highway. Lahaul and Spiti valleys can also be accessed from here during the summers. This small town near Bangalore is a perfect getaway for a nature lover and it is tucked away from the hustle and bustle of the city, which is something that attracts visitors. The flora adds on to the picturesque view along with the exotic wildlife. The area also has a number of beautiful birds which one can spot. There are also a number of fishing camps in the area, which are an added attraction here. The only cool and calm spot amidst the desert in Rajasthan is Mount Abu. The Jain temples of Dilwara is a major attraction here along with various other temples spread across the area. The Nakki lake is also another major attraction to people from across the globe. The months of March and April is when the summer festival begins and it attracts pilgrims from across the country.